Churros are the epitome of sweet street food treats. Make these and serve with melted chocolate for dipping. 1. Start by making the churros. 2. Mix the sugar and cinnamon in a wide container. 3. Bring the water, salt and vanilla vigorously to the boil. 4. Remove from heat and beat in the flour until absorbed and forms a sticky dough. Allow to cool slightly and beat in the egg. 5. Take a piping bag with a fluted nosel and pipe into 6 cm strips onto a baking paper. 6. Deep fry the churros for approx. 4 minutes until golden in hot oil. 7. Roll the churros in the sugar mixture. 8. 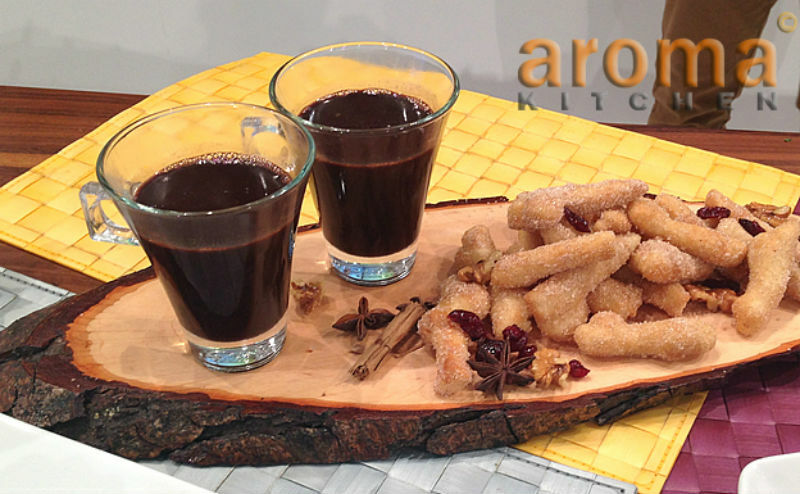 Serve warm accompanied with the hot melted chocolate. 1. For the mulled wine, bring the water, sugar, cocoa, spices and chocolate to a simmering point, whisking continuously until the chocolate has melted. 2. Remove from heat, slice the clementine and add together with the rosemary to the hot chocolate, allowing infusion for approximately 10 minutes. 3. Add the red wine and warm gently before serving.